In this day and age, people rarely meet organically anymore. It seems less common for people to just meet at a bar, begin a conversation and live happily ever after. Instead we pride ourselves in making sure our online profiles are perfect, hoping for the chance to meet a hottie with a body online and have a fairy tale ending. Now itâ€™s come to this â€“ there is a site online for people who met face to face, but didnâ€™t make a move. Itâ€™s known as Craigslist Missed Connections. Missed Connections is a place where people can post things about someone they have met in hopes that person will read it and get in contact with them. For example, a guy saw a cute girl at the grocery store. She was trying to reach for a can of soup on the top shelf that was just out of reach, so he got it for her. She thanked him, flashed a smile and walked away. When he got home he wished that he had asked for her number, so whatâ€™s a guy to do? Post about her on missed connections for his second chance at romance. 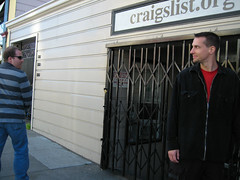 Craigslist is used throughout America and there is a Missed Connections page personalized for almost every major city. Generally the posts involve someone retelling the story of their brief encounter with their possible soul mate followed by a description of what the person looks like and a way to get in contact. While in a way itâ€™s great that people can have this second chance at a connection, reading the posts can be quite comical. I guess some people just donâ€™t have the courage to make that first impression count. While laughable to many, there are some people who check the site religiously to see if anyone has posted about them, in hopes of finding true love. In reality, I believe, if you donâ€™t take advantage of that first chance at meeting someone, it probably wasnâ€™t meant to be. The truth is that most people who post on Craigslist Missed Connections probably wonâ€™t end up with a life that seems straight out of a romantic comedy screenplay, but it has happened, which makes me wonder, could this be the new, hip way of dating? Just to be safe, you may want to check out Missed Connections. You may have flattered a cute barista lately that is looking for you, awaiting your happily ever after.